← Here Comes Our New Greenhouse! In some ways, this is not our favorite Newsletter that didn’t make it into our Blog. It explains how and why we built our Greenhouse the way we did, but when you see our Jan. 2019 Newsletter, you’ll see our progress has been slow (for many reasons including financial ones). Just like what has happened so many times, these Newsletters about Diabetes have been eye-opening, scary and full of hope. In this Newsletter, which is Part B of this series on Diabetes, we share the awful truth about how destructive Diabetes can be to our Hearts and our Eyes, two of the most important components of the human body. In Part A, we shared how Diabetes can destroy our kidneys as well. Surprisingly, we’ve discovered that Diabetes is the Number 3 Killer of Americans along with Heart Disease and Cancer. But there’s HOPE for the millions of Diabetics out there; and we share exactly what that hope is in this Newsletter. We’re also writing a Part C for April, which will go into detail about how to completely CURE Type 2 Diabetes. So Come Back and Thank You for following our Newsletters. Here’s our February 2017 Newsletter in case you missed it. This Newsletter is all about the construction of our new Greenhouse in Arizona. We chose our new home because it already had this 75ft. x 15ft. slab with a covered patio that we uncovered to create our Greenhouse. Get the step by step instructions on how to do this here. We repeat! This is War! And Diabetes is the Enemy. It must be identified, dealt with and then conquered! This 2-Part Newsletter is about how to wage this battle, and it is Part 18 of our Series on Obesity In AMERICA! We missed coordinating Heart Month, which was February, with this Part B Newsletter about Diabetes. (If you haven’t read our Part A Diabetes Newsletter, go back and read our January Newsletter, which is listed in our Archives in the left column here, or just click the above Links. There is a direct correlation between Diabetes and Heart Disease. In fact, one of the main reasons that Diabetes has been able to hide in the shadows for so long before being declared one of the top three killers of Americans is because it was hiding behind both kidney and heart failures, which weren’t being properly attributed to this scourge. We discussed how Diabetes destroys the kidneys in our Part A, January Newsletter. 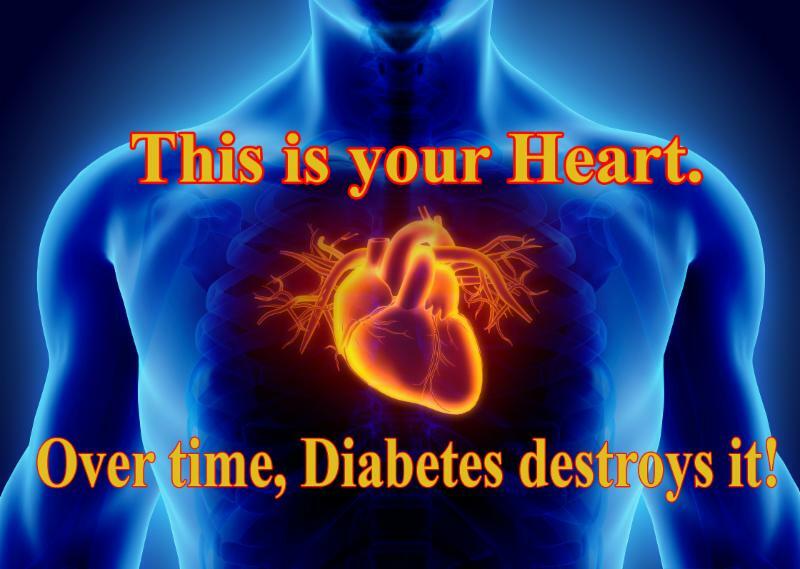 Now, it’s time to discuss how Diabetes affects and destroys the heart. This section like the segment on Diabetic Kidney disease from our Part A, January Newsletter is both shocking and scary because so little about these devastating relationships between Diabetes and kidney and heart failure is known by most of us. We get diagnosed with Diabetes or hear a loved one has been diagnosed and simply think it’s a sugar regulation issue that requires avoiding sweets and desserts. No one gives a thought to the possibility that this ubiquitous disease could result in kidney or heart failure. According to David S.H. Bell, MB, FACE, in an article he wrote in late 2003 about Diabetes Care, “we have learned [over the past 30 years] that diabetic cardiomyopathy is not a rare condition but instead a very common one, and that its etiology is largely due to hyperglycemia with contributions from the insulin resistance syndrome that cause left ventricular hypertrophy” [which means enlargement] (Quote taken from the Care.Diabetes Journals website article entitled “Diabetes Care“). In other words, chronic high blood sugar damages the heart! Unfortunately, diabetic cardiomyopathy isn’t the only complication of the heart with which diabetics have to contend. “Diabetes is treatable, but even when glucose levels are under control it greatly increases the risk of heart disease and stroke. That’s because people with diabetes, particularly type 2 diabetes, may have the following conditions that contribute to their risk for developing cardiovascular disease. High blood pressure has long been recognized as a major risk factor for cardiovascular disease. Studies report a positive association between hypertension and insulin resistance. When patients have both hypertension and diabetes, which is a common combination, their risk for cardiovascular disease doubles. Patients with diabetes often have unhealthy cholesterol levels including high LDL (“bad”) cholesterol, low HDL (“good”) cholesterol, and high triglycerides. This triad of poor lipid counts often occurs in patients with premature coronary heart disease. It is also characteristic of a lipid disorder associated with insulin resistance called atherogenic dyslipidemia, or diabetic dyslipidemia in those patients with diabetes. Learn more about cholesterol abnormalities as they relate to diabetes. Obesity is a major risk factor for cardiovascular disease and has been strongly associated with insulin resistance. Weight loss can improve cardiovascular risk, decrease insulin concentration and increase insulin sensitivity. Obesity and insulin resistance also have been associated with other risk factors, including high blood pressure. If that isn’t enough to shake you out of diabetic complacency, nothing will. Oh, wait a minute. Maybe the next segment will be the big awakener. Because it’s all about how diabetes can actually cause and has caused blindness in thousands of Americans. But don’t despair. We didn’t call this Part B, “STOP Diabetes!” for nothing. Unlike what most doctors tell you, Diabetes is a curable disease! So keep reading to find out how to Conquer it. This is One Eye. Over time, Diabetes Can Destroy Both of Your Eyes! Diabetic retinopathy affects blood vessels in the light-sensitive tissue called the retina that lines the back of the eye. It is the most common cause of vision loss among people with diabetes and the leading cause of vision impairment and blindness among working-age adults. Chronically high blood sugar from diabetes is associated with damage to the tiny blood vessels in the retina, leading to diabetic retinopathy. The retina detects light and converts it to signals sent through the optic nerve to the brain. Diabetic retinopathy can cause blood vessels in the retina to leak fluid or hemorrhage (bleed), distorting vision. In its most advanced stage, new abnormal blood vessels proliferate (increase in number) on the surface of the retina, which can lead to scarring and cell loss in the retina. Diabetic macular edema (DME). A consequence of diabetic retinopathy, DME is swelling in an area of the retina called the macula. DME is the most common cause of vision loss among people with diabetic retinopathy. About half of all people with diabetic retinopathy will develop DME. Although it is more likely to occur as diabetic retinopathy worsens, DME can happen at any stage of the disease. Glaucoma is a group of diseases that damage the eye’s optic nerve-the bundle of nerve fibers that connects the eye to the brain. Some types of glaucoma are associated with elevated pressure inside the eye. In adults, diabetes nearly doubles the risk of glaucoma. If you have diabetes or suspect you have it, go to your doctor and get it diagnosed immediately. This is not a disease to ignore or take lightly. It’s a destroyer of one of the most precious senses we have, our eyesight. And keep reading because type 2 of this disease (see definition below) can be completely cured. So What is the relationship between Diabetes and Antioxidants? Most of us are familiar with the word, “Antioxidant” and we pretty much know they are the good guys, but we really don’t understand what it means or what it’s “Anti” about. The prefix, “Anti” means against or opposite of. So what are “Antioxidants” against? Once again we have to get into the medical nomenclature weeds to answer this question, and the answer will most likely surprise you because “Antioxidants” are against that very important element of life we all depend on-Oxygen. For diabetics, the more Antioxidants the better, which could apply to all of us, but is especially helpful to diabetics due to the fact that hyperglycemia episodes (spiking blood sugar) leaves them more susceptible to oxidative damage than their non-diabetic fellows. Exercise is the Best Drug of all for Diabetics! As you exercise, your glucose reserves are depleted and need to be restocked. So the muscle platoon of Pac-Men magically morph in two ways. “They become more sensitive to insulin-a hormone that escorts glucose from the bloodstream into body cells-and they also start to absorb glucose on their own, independently of insulin.” According to Ms. Colgerg-Ochs, “What’s so good about exercise is that even if the muscles are insulin resistant at rest, that’s irrelevant with exercise.” These morphed Pac-Men become like super soldiers that are not insulin resistant during exercise, and the beneficial effects can last “anywhere from two hours to 3 days”. For this reason, Ms. Colberg-Ochs recommends daily exercise for diabetics. When a diabetic adds aerobic and resistance training to his/her life, they are choosing to be strong super humans that can actually change their body composition in such a way that their “muscles become better at using glucose for their energy needs.” This is a far superior choice than the one that is making Big Pharma rich from the next Diabetes drug with all of its masking of the real problem, side effects and complications. Here’s the good news. Type 2 Diabetes can be cured! You can be Diabetes Free! Here’s the Book that Promises and Delivers “The End of Diabetes”. “Type 1 diabetes is an autoimmune disease, which means it results from the immune system mistakenly attacking parts of the body. In the case of type 1 diabetes, the immune system incorrectly targets insulin-producing beta cells in the pancreas. Nobody knows why this occurs, or how to stop it. The immune systems of people with type 1 diabetes continue to attack beta cells until the pancreas is incapable of producing insulin. People with type 1 diabetes need to inject themselves with insulin to compensate for the death of their beta cells. Everyone with type 1 diabetes is insulin-dependent.” The Dr. Fuhrman Nutritarian Plan can help Type 1 diabetics, but it can’t cure them. Most Type 1 diabetics contract their disease early in life, and need to deal with it until they die, which is often a shorter life span than non Type 1 diabetics. If you or a loved one has been diagnosed with type 2 diabetes or pre-diabetes, this book is your road map to wellness. But the first thing you have to do is be willing to DRASTICALLY CHANGE the way you eat. This book explains why almost 30% of our U.S. population has diagnosed diabetes or undiagnosed (called pre-) diabetes. That translates to almost 30 million people who have already been diagnosed with diabetes and another 8 million people who are in pre-diabetic condition. Dr. Fuhrman explains what’s wrong with the Standard American Diet, which translates into the absolutely apt acronym, SAD. He leaves no sacred cow (especially the meat and dairy industries’ cows) untouched, and he makes a very convincing case for becoming what he calls a “Nutritarian”. Nutritarians eat not according to customs, taste or habit. They eat according to the number of nutrients per calorie in their food choices, and when it’s all said and done, the most nutrient rich foods are fruits, vegetables and beans. Dr. Fuhrman calls it the “Beans and Greens” Plan, and it’s not a Diet. It’s a life style-a life style that completely cures diabetes. If you also purchase his “Eat To Live” Cookbook, you’re on the way to learning how to LIVE without animal protein, dairy, oils, white nutrient deficient carbohydrates like white rice, white bread, pasta, potatoes and pizza. These are the high glycemic foods that spike a diabetics blood sugar into a hyperglycemic state with breakneck speed and perpetuate the diabetic’s roller coaster ride of hyperglycemia (high blood sugar) to hypoglycemia (low blood sugar), which over time ends up destroying his/her kidneys, eyes and heart. Remember, diabetes has recently been declared the 3rd leading cause of death next to cancer and heart disease. This book combo is the cure. No more drugs, no more insulin. No more diabetic roller coaster rides for type 2 diabetics. Once again, we’re being the guinea pigs and learning how to Be Nutritarians, and we’re going to share our personal stories and favorite recipes right along with our blood glucose numbers. We’ll also get you up to date on the Construction of our new Greenhouse where we will be able to grow much of our Nutritarian fruits and veggies. We’ve added “Classes” to our Menu Bar at the top of every page on our Aquaponics USA website. Right now, the above Announcement is all you will see; but we’ll be posting a fully detailed page soon with Dates, Times, Pricing and Content. In many ways and especially when it comes to Big Food, we are all David of David and Goliath-little men fighting the big, rigged cog controlled by huge corporations that are in bed with government. The fact that almost 30 million Americans have Diabetes is testimony that Goliath is still winning; but the war is far from over because us little people are legion and more and more of us are sharing the truth about the horrible state of our Food System. Please FORWARD this email to your colleagues, friends and family who have Diabetes or whom you believe may be pre-Diabetic. They need to become aware of the dangers of Diabetes and the importance of healthy eating. We can’t make the changes we need to make without first understanding why the changes are so important. We can save lives and our country with this information. Offer Ends May 25th at Midnight!